Pyrazole is an aromatic heterocyclic compound characterized by a five membered ring with formula C3H3N2H. The two nitrogen atoms are adjacent and as we saw for imidazole one of them is a "pyrrole-like" nitrogen while the other is a "pyridine-like" nitrogen. In order to quickly refresh your memory, a "pyrrole-like" nitrogen is a non-basic nitrogen, with a lone pair involved in aromaticity, but rather acidic (can be deprotonated quite easily, i.e with NaH) whereas the "pyridine-like" nitrogen has a lone pair on a sp2 orbital and is therefore basic and nucleophilic. Pyrazole structure is not as perfectly symmetric as imidazole one. Consequently, there are slight differences in reactivity and acid-base properties. As you can see from the map of electron density, this structure is not perfectly symmetric and therefore one of this two is prevailing over the other to some extent. Just like imidazole pyrazole is an amphoteric substance. In addition, we have to say that pyrazole is slightly more acidic, but, above all, much less basic. Why? How can we explain the lower alkalinity of pyrazole compared to imidazole? For sure, this means that the resulting cation in pyrazole is not as stabilized as in imidazole. The "pyrrole-like" nitrogen behaves like a strong electro-withdrawing group. Electrowithdrawing groups are good in stabilizing negative charges, not the contrary (electron withdrawing group drain electron density). 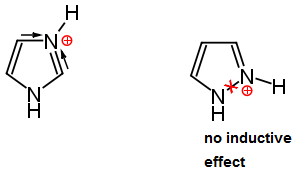 We can also consider the situation from the opposite perspective: in imidazole the cation is stabilized for inductive effect and also less influenced by the electron withdrawing behaviour of nitrogen. The additional nitrogen atom (N) compared to pyrrole reduces the overall electron density on the remaining carbons! We've to consider that in spite of pyrazole (and it's true for imidazole as well) is not as reactive as pyrrole in electrophilic aromatic substitution is still an electron-rich species, because has 6 π electrons on 5 atoms and it is therefore much more reactive than benzene towards electrophiles. Exactly as we expected it to be, the carbon (-4 position) showing the higher electron density is the further from the two nitrogen atoms. Carbons adjacent to the nitrogen atoms are instead electron-deficient and they are indeed very little interested in doing electrophilic substitution. As we had correctly deduced considering the electron density map the electrophilic aromatic substitution happen at the "electron-rich" carbon, that is the farthest (-4 position) from nitrogen atoms. The more acidic proton is of course that bound to the pyrrole-like nitrogen. If we treat pyrazole with a strong base we can easily generate a nitrogen atom that can afterwards react with an electrophile. How would you synthesize an heterocycle containing five atoms with 2 of them adjacent nitrogen atoms? A good approach, notwithstanding is no more the most commonly used, simply consists in using hydrazin and a 1-3 dicarbonyl compound, both reagents commercially available.